In my quest to locate the train or locomotive I used to ride as a small boy with my grandfather in Hillsborough, NC I have been able to locate many pictures and much info regarding the old engine and cars. The story started when I posted a story and photo of me in front of the train on this forum on January 3rd something interesting happened. Click HERE for the initial post. A THIRD POST was written detailing the whereabouts of one of the old engines that used to operate on the Daniel Boone RR. It sits in Florida…sadly, rotting away. Imagine my excitement when a reader emailed me an mp3 of the actual Daniel Boone Railroad theme song. Obviously, he captured it from vinyl. I thought it would be fun to take the tune and some pictures and create a YouTube video to share. I sprinkled in a couple of other pictures to keep in interesting. Hope you enjoy it. All we’ll ever have are memories. I would love to get any photos you may have of the old train, station or railroad line. Please email them to tarheeltrains at gmail dot com. Tarheeltrains can you forward my email to Mrs Britt, I would like to send her a copy CD of both sides there is a Instrmental on the other side That her dad is playing. Thank you , Shannon! 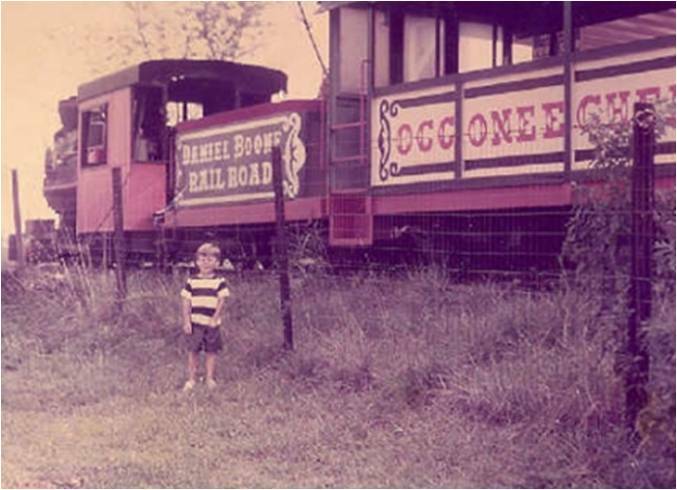 If you have an pictures of the Daniel Boone RR or theme park we would love to get copies! Hey great job with the song. We are trying to get a cleaner copy of the song as soon as we are sucessful I will send it to you.Keep up the good work. Get To Know…Train Artist, Andy Fletcher!